Leading Exporter of trendy kids clothes, boys designer clothes, exclusive kids clothes, fashion style clothes, kids fashion clothes and kids stylish clothes from Mumbai. Our company is considered to be one of the most prestigious and renowned one in the line of exporter and trade one of the most exclusive quality materials in garments and dressing industry. We offer a colorful range of Trendy Kids Clothes. In order to meet the individual requirements, we offer creative collection of Boys Designer Clothes that are acclaimed for optimum quality and creative designs. 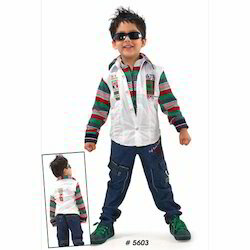 Based on the specifications of the client, we can customize our range of Boys Designer Clothes based on color, design. 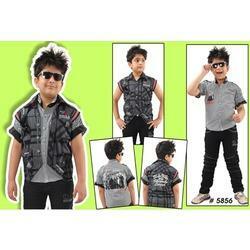 Quality range of Exclusive Kids Clothes is offered by us. Stylishly designed our range is applicable for all kind of functions and parties. Offered products are reckoned amongst the clients for their washable nature and shrink resistant. Looking for Kids Clothes ?